A wonderful evening of Indian Classical music. 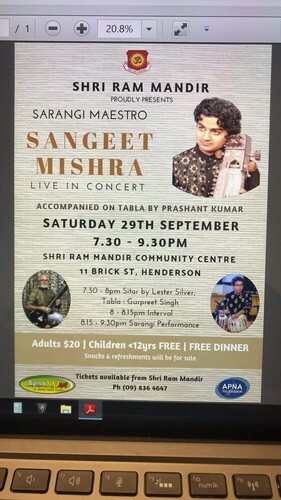 8.15pm to 9.30pm Sarangi performance by Mumbai India's one of the best artists Sangeet Mishra. He will perform classical as well as folk music. Sangeet will be accompanied by Mayank Tendulkar , a classical vocalist of Auckland. Accompanying him on tabla will be young tabla Player Prashant Kumar of Auckland. Tickets only $20.00 including Indian vegetarian dinner.